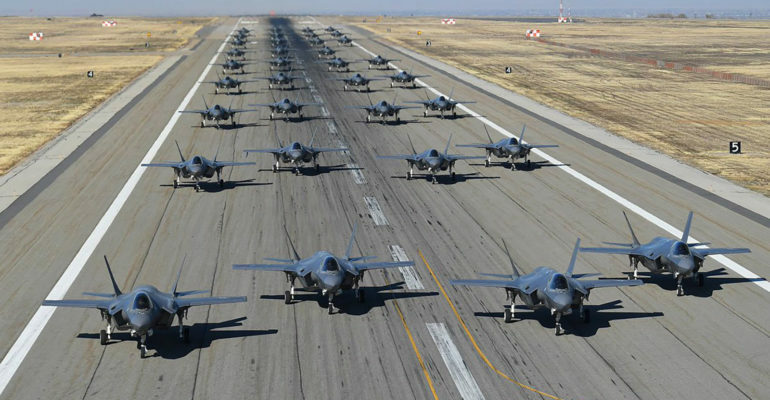 There are three variants of the F-35, the F-35A, F-35B, and F-35C. The variants were designed to accommodate different methods of takeoff/landing. To learn more about the F-35’s boost phase intercept capabilities, check out the MDAA’s Congressional Roundtable on boost phase intercept missile defense. Transcripts and a recording of the event can be found here. The F-35 has a number of advanced systems, including the most powerful and comprehensive integrated sensor package of any fighter aircraft in history. [xii]Included sensors such as the AN/APG-81 AESA radar and the DAS can be used for missile defense purposes in the boost phase, and for integrating with other missile defense systems. [xiii]If a single F-35 senses a missile launch, the quickest and best response can be launched due to the MADL’s fast transmission speed and interoperability. There are a number of benefits to the F-35’s possible boost-phase intercept capability. Not only are missiles in the boost-phase slower than other phases and more easily intercepted, but they are more likely to land in area controlled by the country or group responsible for the launch. This would make attribution of the launch significantly easier.